That is Something Even I Just Couldn't Do. What may be more grim is the abundance of "how cool is THAT!" type comments on the link attached. Oh, you would'nt money to look like that! But if someone offered to let you use one for a while- HA!- you'd do it in a flash! 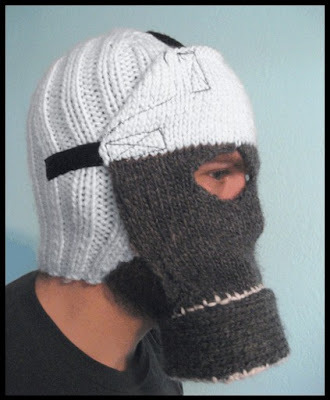 Wow, a knitted gas-mask cozy! That makes quite a fashion statement. BTW: "Gas-Mask Cozy" would make a helluva band name or album title. Maybe I'll use it for the project I'm currently working on. Anon - you saw those too, eh? Agreed. Knitters freak me out. ChipSeal - Nope, in this case I really wouldn't. Jon - Band Name, yes. Facial wear, no. i'd do it, with a -30 windchill here in Toronto count me in..
Xander - I'm all for covering my face when it is cold enough, but I'll take a good old belaclava (and breathing mask, if necessary) over a knitted snuffalupagus face. I'd like to see ANY of you with the guts to walk into a Seven Eleven with that on! The gang at work got wind of this blog post, and now they are taking up a collection to have me wear at work! "To beautify the office" they say! Yeah, no lie. I didn't see the irony until after I wrote the post! Do you find that a little bit creepy, dear Rantwick, like I do? reminds me of the first time i went into my bank with the balaclava on LOL! ChipSeal - Find what creepy? Chandra - You didn't...did you? He he. The word verification word was "judger", and my comment was about folks critical about my countenance. ChipSeal - Ahah! Understood. Captchas seem to do that kind of stuff fairly often, it seems to me. Yes, but how did it know? It is sorta like those public maps at malls and such, that point out that "you are here". How do they know that I would be right there in that particular spot at that exact time? Jeez, real creepy, if you ask me. Anon - that video was very very cool. Thanks!